A month or so ago I pulled this stash of fabrics that I thought was lovely, soft and pretty (original post here). The block I originally made with this fabric pull did not excite me as much as I would have liked. Fast forward a month, and after working on a collection of graphic, bright quilts, I wanted something different. This is where I ended up…. I am loving how this quilt is coming together. It is fabulously easy, fabulously scrappy and fabulously girly. It is being made almost completely from my scrap bin, and I have only had to cut some of the longer strips so far. I have not been stressing at all about choosing the fabrics – I have full embraced just going with the first strip of fabric that I pull out of my pile. It is very liberating. There is an “I Spy” element to these blocks which will make for a great baby/kids quilt. I want to finish this one in time for SwimBikeSew’s 100 Quilts for Kids drive which started this week. Very pretty blocks! They will make a great, girly kids quilt. Love love love these colors together!!! How many blocks do you think you’re going to make all together? Hi Ashley. Hope the vacation was fabulous. I am planning on making 30 blocks – 5 across x 6 down. The blocks are 8 inches square so it will be a good baby/young kid size quilt I think. Love them! The colors, especially the corals with the purples, are so pretty! I love the four blocks together, they are definitely great with the lighter colors included and then that wine or purple colors too 🙂 Great variation in depth. Whatever pink voodoo magic you’re casting is definitely working! Although I do think you need a few scraps of Posy in there just for the sake of it. Beautimous! Great minds and all – I just raided my Posy collection and added it to my box of scraps. Yes! I love it! The little patterned fabrics like the bicycles are fantastic. This is one is going to be awesome. Fun colors! I’ve been itching to start a log cabin style quilt but have been agonizing over the fabric choices. Maybe I just need to let go and just start sewing. Diana you should definitely just start, you will not regret it. 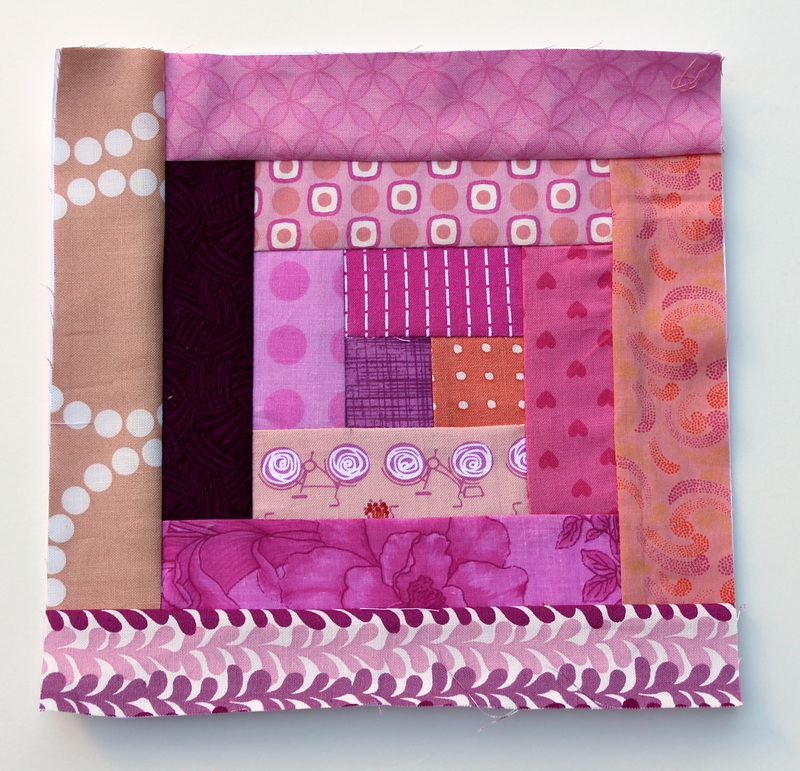 I love the log cabin block – it is almost foolproof and is my favorite way to use lots and lots of scraps. Gorgeous, bright and happy colours . It’s looking great. Very pretty. 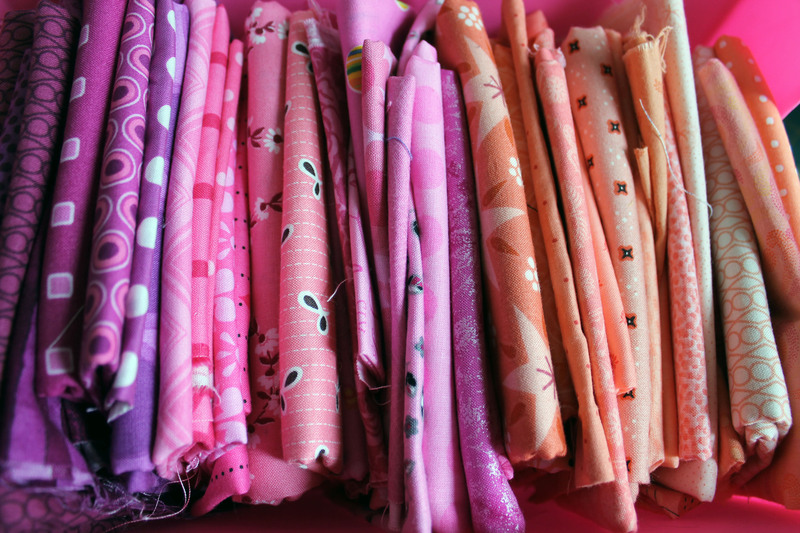 It’s looking gorgeous – I’m envious of your scraps … what a stash! Oooh, pretty! This is going to be a beautiful and cozy quilt! What a gloriously fun quilt this will be! I can imagine a little girl searching for matching fabrics from one block to the next: how many times did she use this fabric, where’s another to match that one, etc. 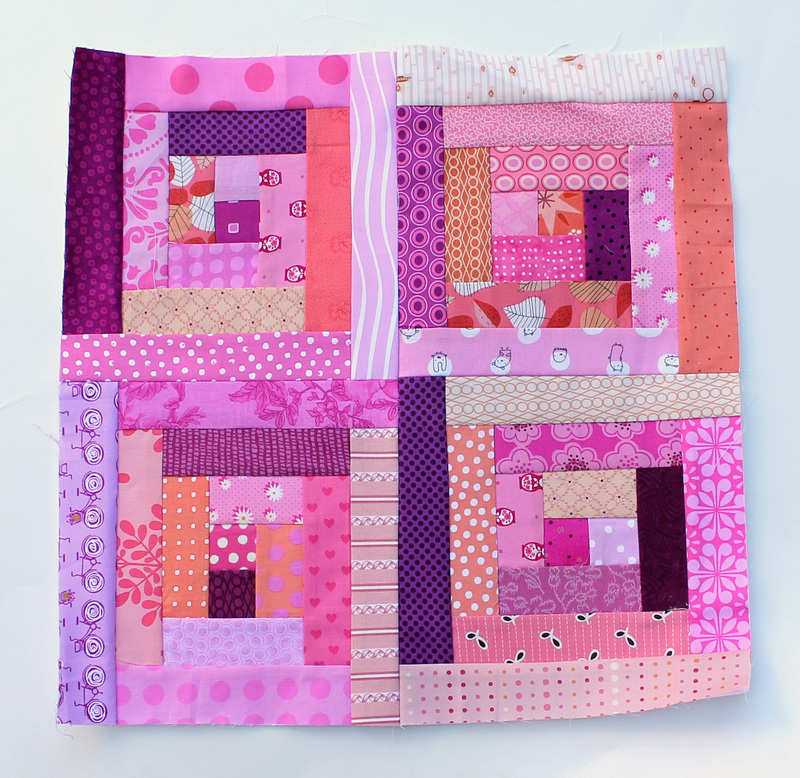 your blocks have so much depth with your choice of fabrics! How satisfying to be using mostly scraps; the child who gets this will love it!! Great job! 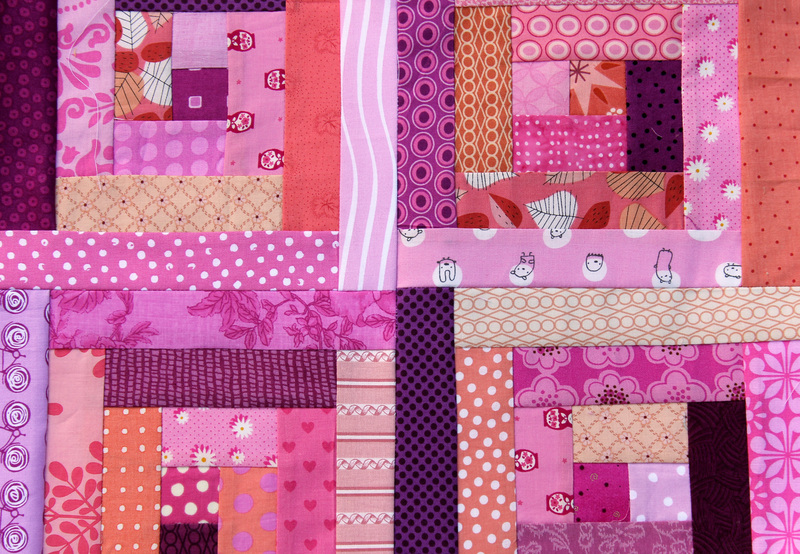 Those fabrics all work so well together and the log cabin blocks look perfect! Great job! I LOVE it!!! The colors are just dreamy! You are a quilting goddess!! I’m not normally a fan of pink, but this is so pretty! I love the I spy element to some of the fabrics, but it is still composed and scrappy. Can’t wait to see more! What a great fabric pull! The colors are so very pretty together – I love log cabins and I Spy’s!